A: This is easy to recognize as primitive folk art from Nepal. Whether or not it originated in the Chitwan region, I can’t tell. Has it been used, or was it made to sell to tourists? If the former, how old might it be? 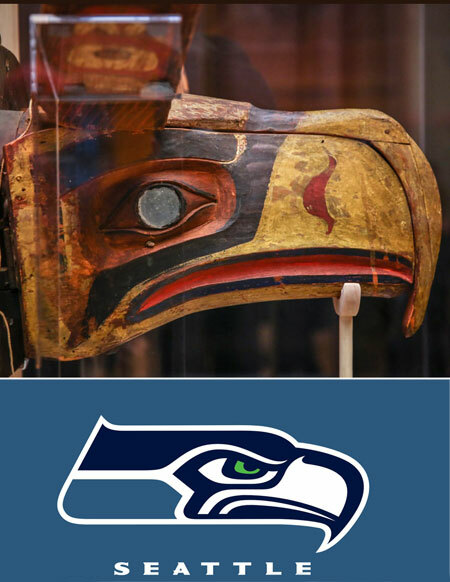 Can I say for sure it is a shaman’s mask, rather than a Hindu or Buddhist character? There are so many questions that need to be researched. The carver went to extremes in decorating this piece. He used leather, fur, metal, beads, shells and animal teeth. It also has a large comfort pad on the rear. None of these add-ons detract from the spiritual power of this mask. THE THARU PEOPLE INHABIT THE TERAI REGION OF NEPAL AND SOME AREAS OF TIBET AS WELL. 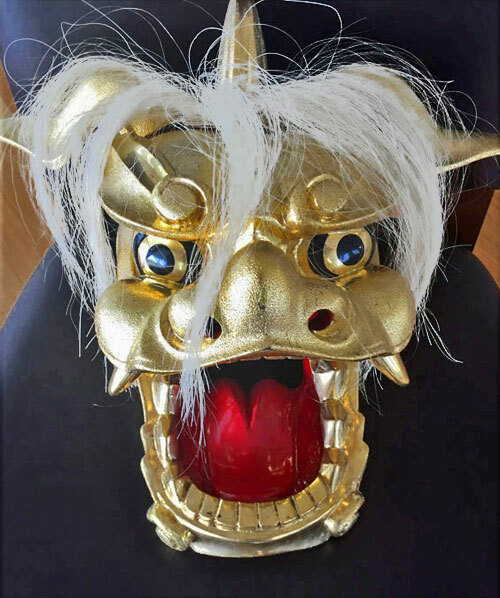 SHAMANIC MASKS LIKE THIS ARE USED IN RELIGIOUS RITUALS, FESTIVALS AND EXORCISMS BY SHAMAN AND SOMETIMES BY BUDDHIST MONKS. 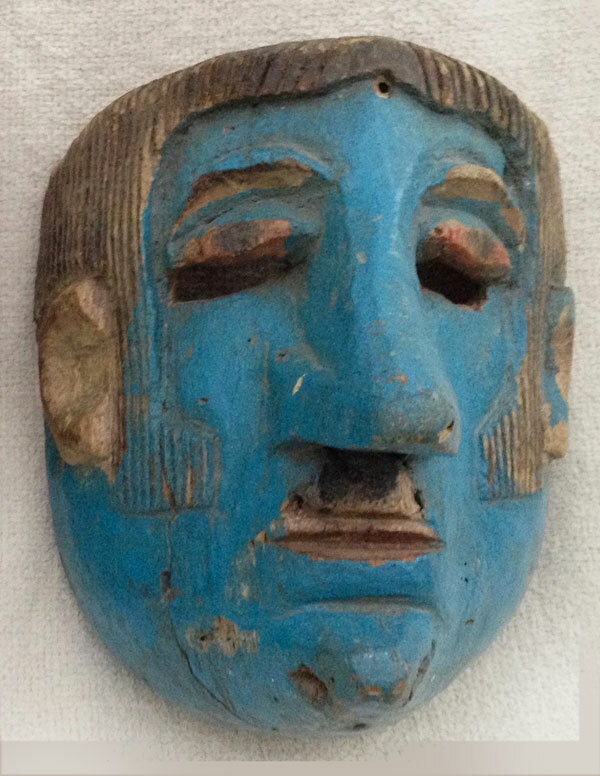 THIS PIECE IS EVEN MORE RARE AND UNUSUAL BECAUSE IT IS REVERSE MASK, WHICH MEANS THAT IT HAS A PADDING ATTACHED TO THE INSIDE OF THE MASK WHICH ALLOWS THE SHAMAN TO WEAR IT EITHER ON TOP OR BEHIND THE HEAD SO THE HE CAN WEAR TWO MASKS AT THE SAME TIME. SHAMAN MASKS WERE ORIGINALLY DERIVED FROM THE TOTEM WORSHIPPING OF ETHNIC MINORITIES IN NORTH & WESTERN CHINA, MONGOLIA, NEPAL AND TIBET. THIS IS A VERY LARGE MASK, VERY SKILFULLY CARVED DEEP INTO THE WOOD GIVING THE MASK GREAT DEPT SO THAT IT CAN BE WORN ON THE FACE OR THE TOP OF THE HEAD. IT WAS CARVED FROM BODI WOOD. THE BODI TREE IS SACRED TO BOTH BUDDHIST AND THARU ANIMISTS AS WELL. I just came across this wonderful site about masks. How l missed it all those years…? OK. I just read the above with great interest as it shows what people are prepared to do to sell their goods and how prepared some people are to believe just about anything. Your mask is very decorative, very probably made in Nepal and definitely made for the tourist market only a few years ago. 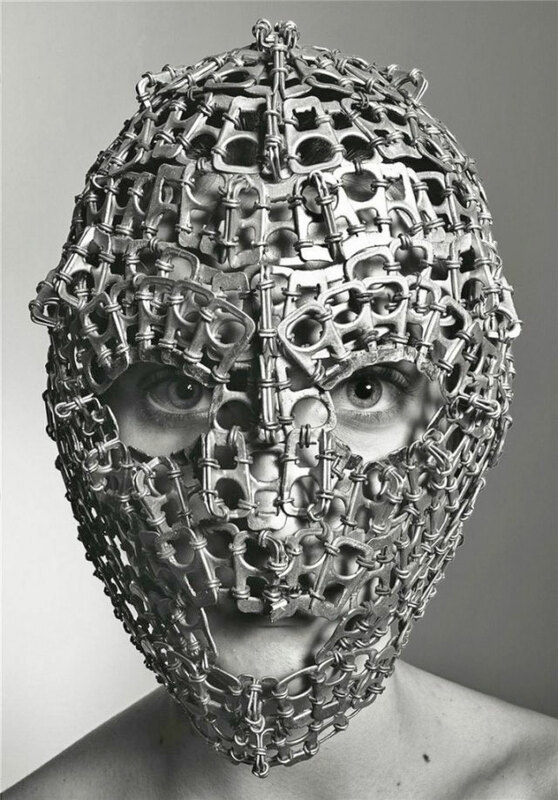 The style is definitely taken from old catalogues/ books of collections of Himalayan Primitive masks that have been published over the past few years. 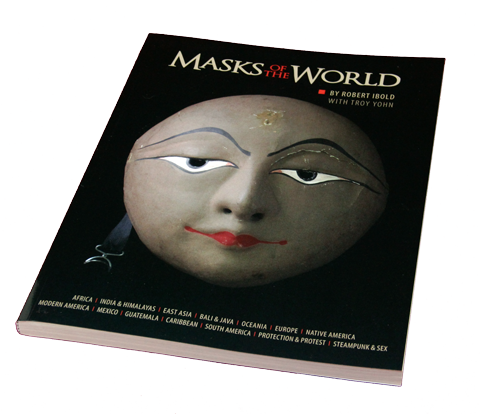 Craftsmen in Nepal get their inspiration from such publications and add a bit more to them. I have been traveling and regularly working in Nepal since 1979. I have seen and handled literally thousands of masks and seen similar ones, although never quite the same. It could be unique, but old? never. The wax stamp at the back is the seal of export out of Nepal for goods that are less than 50 years old. The hair is goat’s hair, not yak and when l read it was made by Taru (Tharu) people from the southern part of Nepal, Terai, it pains me. I have a large collection of masks from only that part of the world and Taru masks are nothing like this. The style is from the northern region, what we call the Middle Hills. There were never Taru people in Tibet and if there are today, they will be tourists like us. The last comment above “carved from the Bodi wood, sacred tree blabla…” it is almost indecent to mention this in order to flog anything apart from Buddhist rosary beads. Why the need to make up such ridiculous stories? 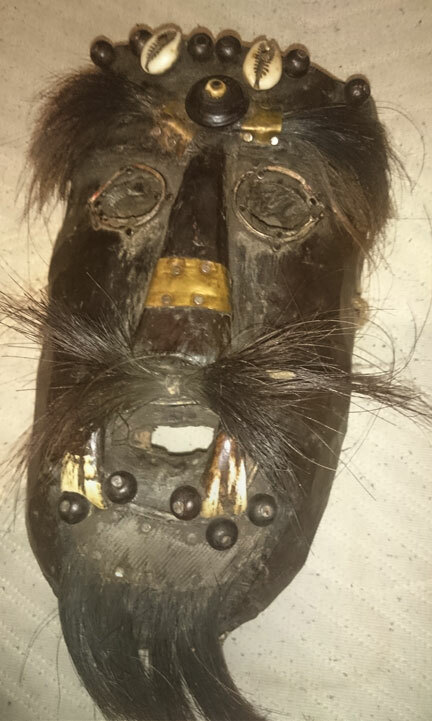 Mind you, on many occasions l have been told the most ridiculous stories in shops in Nepal too…I just laugh, scratch the patina to show the seller that it is only minutes old and tell them that to say to tourists “rare antique tantric shaman’s mask” it is wrong. Another point, Shamen are great ordinary people with extraordinary gifts to help and heal others. They would never-ever wear a mask during their rituals. Admittedly some country folks in the mountain villages similar genuine masks come from do wear grotesque masks during festival like harvest etc… but never a shaman, even in jest. It grieves me that their culture can be used to deceive. The western seller might have been gullable but a real dealer should know what he/she sells. Your mask is great and very decorative. The rest is just not right , at all.